A 51 yo female with visual field defect on right side, confirmed on perimetry. 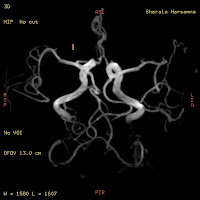 MRI study coronal T2w sections for optic nerves with MR Angiography. ICA : with normal T2 flow voids shown by green arrows. Optic nerves and chiasma shown by yellow arrows. - Right ICA supra clinoid portion high riding on coronal T2w images - a one of normal anatomical variation of ICA, significant in this case as right optic nerve elevated by this high riding ICA and markedly compressed against roof of supra chiasmatic cistern. The finding corresponds to the history of right side visual field defect as rest of the optic nerve and brain parenchyma are normal. 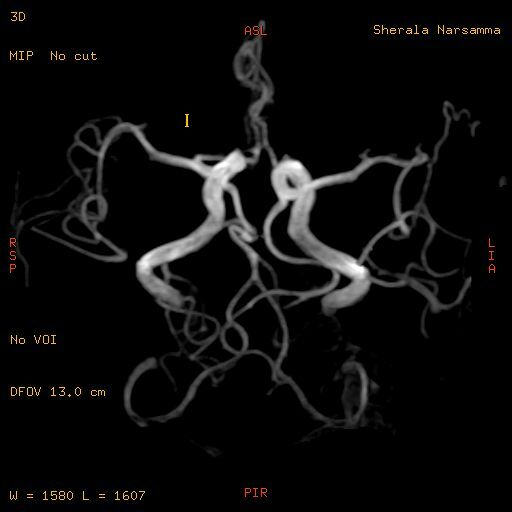 - No any obvious abnormal aneurysmal dilatation of right ICA on 3 D TOF Non contrast MR Angiography. - On left side ICA is just abutting the optic nerve. Ectatic or even normal intra cranial blood vessels can cause dysfunction of cranial nerves when situated in an aberrant location. Occurrence of such compression damage to the optic nerve is poorly recognised, several studies have shown the optic nerves can in fact be damaged by vascular compression. Recently, optic nerve compression by normal internal carotid arteries (ICA) has been suggested as a possible cause of visual field defects in patients with optic neuropathy. A significantly higher percentage of Normal Tension Glaucoma patients had optic nerve compression by the ICA suggests that compression of the optic nerve by ICA may be a possible causative factor for optic nerve damage in some patients with NTG. Is there right optic disc edema? what is the field defect? Is there field defect in other eye since chiasma got involved? very good job..its very informative for each and every medico and non medico..keep it up man.